Come celebrate with the Peruvian penguins at the Aquarium of Niagara from 9:30 a.m. to 4 p.m. March 23rd and March 24th. These loveable flightless birds are among the Aquarium’s most popular residents and this weekend you can participate in a penguin “meet and greet” encounter. Of course, they will be dressed formally for the occasion, but Aquarium guests can dress casually. The 22nd Annual Penguin Days is supported by Niagara Frontier Publications, Niagara Gazette, and Wal-mart. 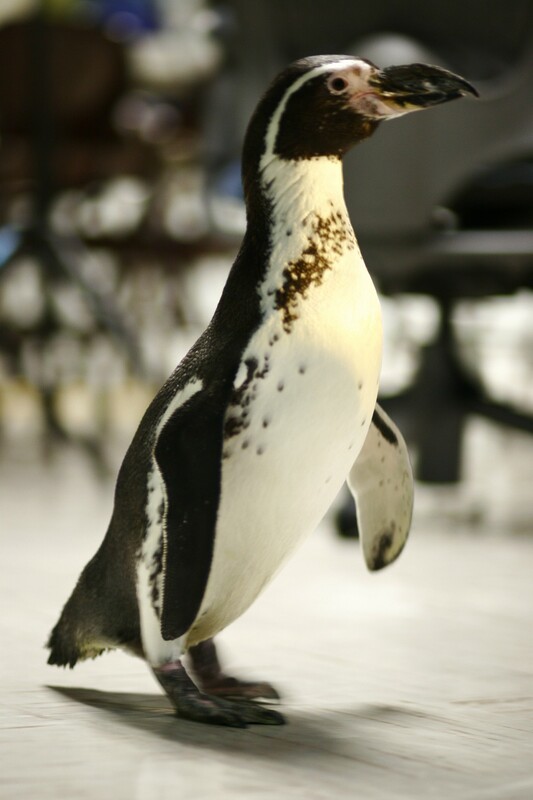 Experienced Exhibit Department staff members will answer all questions about these fun and fascinating birds during regular penguin encounters in the second floor Community Room. “Beaker”, the Aquarium’s penguin mascot, will also be greeting visitors from 10 a.m. – 2 p.m in the “Who Do You Sea” area. Challenge your artistic skills by participating in the NEW penguin drawing contest with a “plethora of penguin prizes” for the winner. Children can make their own penguin colony of finger puppets, visit the “Sea N Do” Shack and learn more about penguin conservation while exploring the penguin lab. There will be penguin gifts, including original penguin art, available for purchase. Adopt-a-Penguin certificates can be purchased by anyone wishing to sponsor an Aquarium penguin for one year. Don’t forget to stop by our other exhibits including seahorses, poison dart frogs, ”Twister” the octopus, sharks, and display of large shells on loan from collector Mike Fisher of Amherst. The Aquarium’s regular schedule of California sea lion demonstrations and harbor seal feedings will continue as usual throughout the weekend. Penguin encounters are included in regular admission of $10.00 for adults, $8.00 for seniors, $6.00 for children, and free for 2 and under. Members are free. Admission to penguin encounters will be determined by availability of tickets and space.